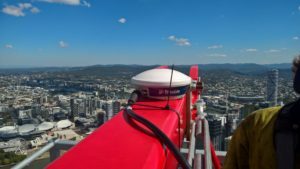 When one of Australia’s truly landmark projects, the record-breaking Brisbane Skytower needed a real-time monitoring solution they turned to UPG to help. 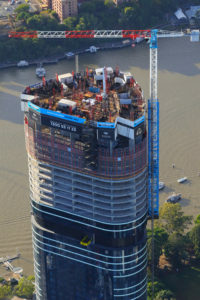 Hutchinson Builders, who are constructing the 90 floor, 270m tower that will boast 1141 apartments and will be one of the Southern Hemispheres tallest residential buildings, were restricted by the Civil Aviation Safety Authorities (CASA) height limit of 274.3m over Brisbane’s CBD, which restricts the height the crane can work at. 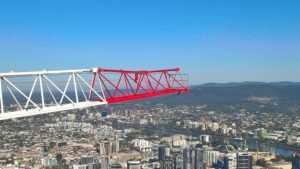 The height ceiling has been put on the crane as it is operating in a critical flight path for the nearby Brisbane International Airport and any structure in this zone can interfere with the airport’s radar and navigational control systems. 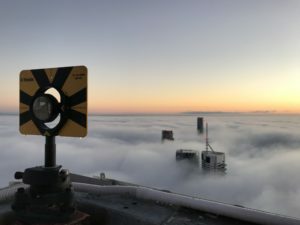 Permission was granted for the crane to operate above the height limit during daylight hours only and with strict conditions, including the continual monitoring of the crane height by CASA, based in Canberra, and by Brisbane Airport itself. The solution was to place the crane on hydraulic jacks that raise and lower the crane as required. GPS monitoring units were needed on top of the A-Frame and end of the boom to then transmit the data to a secure website. UPG was contracted to install the system and within a week the monitoring system was live, allowing parties from around the country to access a live feed of the data. Trimble 4D delivered this effectively and with a variety of views and information. “We created a customised view that displays various graphs and images on a single online page to allow one-stop viewing for all required details,” UPG’s Brent Dawson said. The installation of the monitoring technology on the crane was not one for anybody with a fear of heights, as the photos show, requiring the operators to scale the boom to place the NetR9 TIMs. The system allows real-time monitoring to ensure the crane is parked safely at night as well as not operating outside the allowed limit during the day or during inclement low-visibility weather conditions. “We initially used the UPG Monitoring As A Service (MAAS). Along with our on-site surveyor, their team of experts commissioned and managed the system,” Hutchinson Builders Andy Rivers said. “The roll out and commissioning was seamless and allowed for operations to continue on-site as planned,” he said. 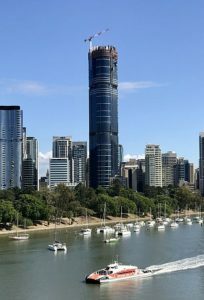 UPG is delighted to have played a key role in conducting the monitoring work for this landmark project and in assisting Hutchinson in being the first to reach Brisbane’s building height limit. UPG has the solution for your project. Contact us today to find out how we can help. Keeping a close eye on a vital and extensive infrastructure complex in the Northern Territory around the clock and in virtually all weather conditions has become a reality thanks to Trimble technology, UPG (Ultimate Positioning Group) expertise and the foresight of a highly regarded surveying group. Earl James and Associates (EJA), which was established in 1982, have employed the Trimble T4D system operating with two S9 robotic total stations, supplied by UPG. 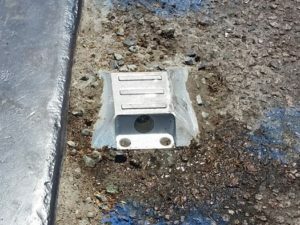 The system has enabled automated monitoring of a concrete structure’s subsidence in the Northern Territory since the middle of last year. The system is configured to measure 70 monitoring prisms installed along the structure every hour around the clock with the results streamed live via the internet. From this, results and data can be viewed from any connected device for analyses, and configured to send email and SMS alerts should movement be identified that exceeds set parameters. EJA installed the equipment and system which was then followed by UPG’s T4D ‘guru’ Brent Dawson coming to the site to do training and assist with the system’s configuration. There were a number of hurdles to overcome in the early stages due to poor internet connection at the site and power issues. UPG worked with EJA around the clock to ensure delivery of the product met client expectations and our own Brent Dawson was instrumental in problem shooting. The hurdles were overcome and the system has proven to be reliable despite the extremely harsh conditions the instruments are operating in. 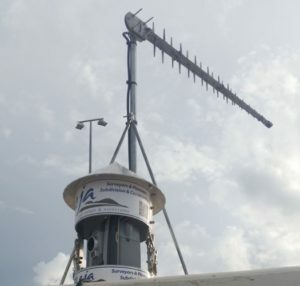 In fact, the system didn’t so much as miss a beat during a recent cyclone in the region, even continuing to stream data while crews cleaned up the site, post-cyclone. Also, at the time of preparing this article, one of the S9 Instruments currently has 6900 hours continuous operation without issue. EJA’s Franck Delmas said while Trimble had been its preferred supplier, and in turn UPG, for many years, the service and support was a big part of why the firm continues to work with UPG. “Brent Dawson really went above and beyond for us to ensure the system was delivering what we needed,” he said. Franck also said the use of Trimble S9 robotic stations meant they could be utilised for other work after this project was completed. “We have a two-year contract on this monitoring project. If that isn’t extended, we know we will be able to put the S9’s to good use in other areas of our business,” he said. Find out how UPG can help your operations – call us on 1800 800 UPG. One of the 70 low profile monitoring prisms on site. These are specifically designed to allow vehicles to run over them. 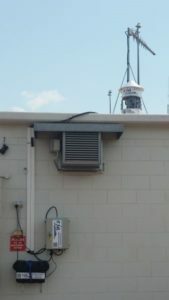 Custom built weather-proof housing and high gain cellular antenna. 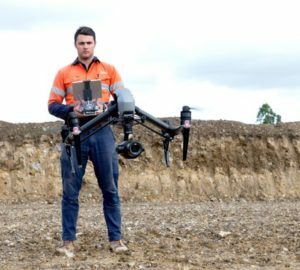 A quarry on the outskirts of Melbourne proved to be the perfect location for the UPG Flight School to show off its stuff for a series of stunning videos. 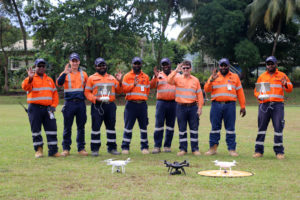 Created by the team from SUDDEN.ly (formerly News Corp Studios Qld), the videos and stills have been used for social media posts as well as on the UPG drone’s pages. The aim of the videos was to convey just what the school can do for clients, in the areas of hardware, software and training. UPG distributes both DJI and senseFly drones – industry leaders in their respective categories. “As the multi-rotor industry leader, DJI has developed one of the strongest brand names in the market,” Chief remote pilot and instructor, Lorenzo Forte said. The range includes: Phantom 4 Pro - Entry level drone for surveying or video inspection; Inspire 2 - High performance system surveying or inspection; and Matrice 200 Series - Professional grade range for surveying, video, thermal or zoom inspection. SenseFly is one of the leading manufacturers of fixed wing drones and are the go-to for survey or agricultural mapping work. The range includes: eBee standard - Mainstay survey aircraft for use with ground control points; eBee X - High performance survey aircraft - uses ground control or RTK/PPK workflow. Interchangeable multispectral or thermal cameras; and eBee SQ - Agricultural mapping aircraft. “The major difference from other training providers is that UPG focuses mainly on professionals and corporate clients. 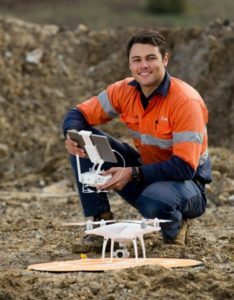 The course covers the compulsory CASA syllabus and offers additional assistance in integrating drone operations in mining, surveying and assets management workflows. Lorenzo said UPG offers a variety of photogrammetry and survey software to meet all customer needs. “The most powerful solution is Trimble Business Centre with the Aerial Photogrammetry Module (UAS Master),” he said. “UAS Master integrates with Trimble Business Centre and offers leading-edge tools to analyse your data. It provides full control on the data processing workflow and allows the creation of advanced outputs. Lorenzo said Trimble Stratus was the latest software offering from Trimble delivered in partnership with Propeller Aero. “Stratus allows to effectively share your data within your organisation and clients while relieving surveyors and operators of data processing downtime,” he said. “Its powerful web-based data analysis tool allows a quick assessment of stockpiles, road gradient and comparison between the profile design and bulk earthwork. The shoot has been exciting but also challenging for both parties, Lorenzo said. “The UPG team did not have any previous experience creating professional videos and working in front of a camera. UPG Technical Consultant and Instructor, Kieran Dinuzzo, said he enjoyed the experience. “Cameraman Michael Sloane kept the camera rolling, following us around like in a film set. He worked relentlessly to stay on schedule and collect great footage,” he said. UPG Flight School collected aerial images to build 3D maps and models of the site. At the same time, they explained the process and their products by conducting interviews on site. 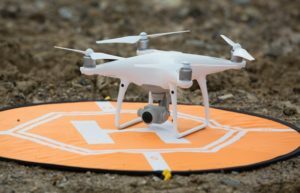 “It was challenging to collect aerial data with multiple drones while capturing photos and videos. Michael made us feel like professional actors when he set up an interview on the edge of the quarry,” laughed Kieran. The footage and stills were collected in less than six hours while the UPG crew flew drones to capture the site. “We could not be happier with the result. I understand that it is always difficult to summarise complex workflows in a minute-long film, however, the videos achieved that goal exceptionally well,” Lorenzo said. SUDDEN.ly journalist and cameraman Michael Sloane said it had been a shoot to remember. “I'd never seen a fixed wing drone before, nor any kind of UAV taking a programmed flight path for aerial distance readings, so it was interesting to see how these went up and their different strengths in the air,” he said. The shoot didn’t come without its challenges, Michael said. “Of course, shooting small drones in the sky hundreds of metres away from the camera was difficult, but I was given the chance to use the controls of the on-board camera of one of the drones to capture another in mid-flight,” he said. Catalyst has taken top honors at the 2017 NZ Spatial Excellence Awards, securing the Supreme Excellence Award and the award for Innovation & Commercialization. Bringing together innovators from the NZ spatial industries, the awards recognize products or projects that made a significant contribution to the industry through the introduction of a new idea, method, technology, process or application resulting in social, environmental and/or economic benefits. There is nothing like the Trimble SX10 in the market. It merges high-speed 3D scanning, enhanced Trimble VISION™ imaging technology and high-accuracy total station measurements into familiar field and office workflows for surveyors. “The unique advantages the SX10 offers surveyors, engineers and geospatial professionals will allow them to tackle virtually any project with ease,” said Ron Bisio, vice president of Trimble’s Geospatial Division. Like all Trimble solutions, the SX10 is built on established and trusted technology. 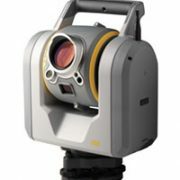 Contact us to learn more about the new Trimble SX10 and how you can get an advanced viewing.